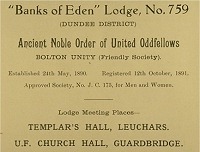 In the Lothians, Edinburgh and Fife there were by 1900 five different Orders of Oddfellows operating simultaneously and, even more confusingly, three were based at Oddfellows Hall in Forrest Road, Edinburgh. To add to the confusion, many independent lodges flourished. The bodies were, in order of appearance in the Edinburgh and Leith PO Directory. This Order appears to be the original proprietors of Oddfellows Hall, and had a district and lodge structure by 1870. By 1890 there were 3 lodges including City of Edinburgh No 1 (founded 14 April 1840), Dun-Edin No 2, and St Bernard's No 3; juvenile branches were attached to several under the lodge name Edina. The Order was still present in 1960. 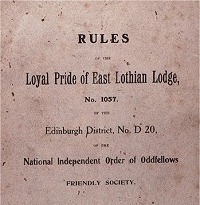 The Order appears in the Edinburgh PO Directory around 1890, the district headquarters and registered office being at Oddfellows Hall, Forrest Road. In Edinburgh there were then three affiliated lodges - Sir Ralph Abercromby No 3456, Excelsior No 6108, and Persevere No 7684. The order disappears from the Directories during the first world war (when a female-only lodge was listed briefly). In the early part of the 20th century order had numerically the strongest following in the Lothians, with 13 lodges in Edinburgh and District by 1900 of which 9 were still functioning in 1960. The Order would seem to have grown in strength as statutory benefits became established. In East Lothian a single lodge, Loyal Pride of East Lothian No 1057, subsumed all other local Oddfellow lodges on its formation after 1911. Most of these, such as Loyal Tyneside in Haddington, Loyal Tantallon at North Berwick and Loyal Hope at Dunbar had been affiliated to the Manchester Unity. Loyal Pride was originally based at (Good) Templar's Hall in Dunbar, moving to the Parish Church Hall during the first world war. It survived into the late 1950s, at which time the Secretary was travelling regularly from Dunbar to Tranent simply to get his books checked. He recalled (2002) that 'the membership was getting old' and the Lodge combined with one at Newtongrange, Midlothian; all subsequent business was transacted there. Unlike many Oddfellows' lodges the Pride of East Lothian took little interest in regalia and other esoteric matters. The Order survived into the 21st century, headquartered in Manchester. The sole lodge in the Edinburgh area was the Persevere, No 43, meeting at Hope Street, Leith Walk in 1910. This lodge shared a name, but not number, with a Manchester Unity lodge. A Dalrymple Lodge is also known, but its base is unknown. The order disappeared during the first world war and its fate is unknown. At least four other orders affiliated lodges in the south of Scotland. They were the Ancient and Noble Order of United Oddfellows, the Independent Order of Oddfellows Bolton Unity Friendly Society, the Grand United Order of Oddfellows Friendly Society and the Independent Order of Oddfellows Kingston Unity Friendly Society. Both the Grand United Order and the Kingston Unity survived into the 21st century.